Filling: Without ! COVERS ONLY ! Soak the bedding set in the water for several minutes before washing it. Do not soak the one in hot water . The washing temperature should keep lower than 40℃. Washing the reverse side is recommended. About shipment: Please choose FBA if you are intended to purchase one as gift before special date. The shipping will only takes 24-48 hours. About after-sales service: textiles are special products which constructed by both machines and handmade. We would check them closely before shipment. Manual inspection is not perfect,but we will control errors at a minimum. Please do not hesitate to contact us before you give any negative reviews. We promise that we will solve all of problems immediately . 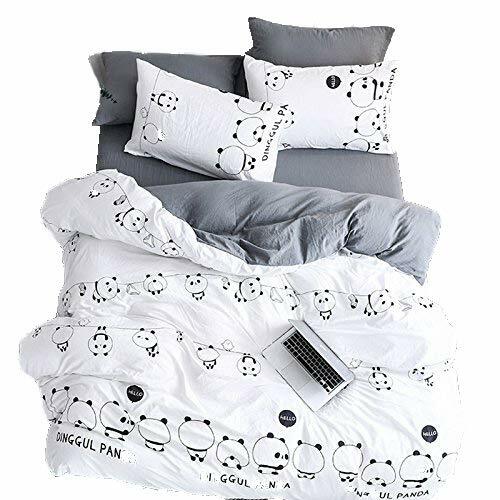 ✦DESIGN- Popular panda pattern for kids makes bedroom bright and helps children to get a better night sleep which wake up feeling refreshed and rejuvenated! ✦WASH INSTRUCTIONS-Machine wash separately or hand wash with low heat. Do not bleach. Do not tumble dry .Iron medium. ✦MEASUREMENTS- NOT COMFORTER! Covers ONLY! FlAT SHEET NOT FITTED SHEET.Cover protects your comforter out of dirty and is super easy to remove and wash with zipper which easy to get your comforter in and out of this cover. The Twin/Full/Queen/King specifications for your reference in below description. ✦Use & Shipment- Lightweight and portable features make your travelling and Business trip convenient, healthy and happy. Best Choice for birthday& wedding gift with quickly shipment. Suitable for all of seasons. If you have any questions about this product by LemonTree, contact us by completing and submitting the form below. If you are looking for a specif part number, please include it with your message.